The Idiom Jack of all trades, master of none is very true and we believe it’s important to know our limits and understand that when we work with other agencies we can create something truly great for our customer. 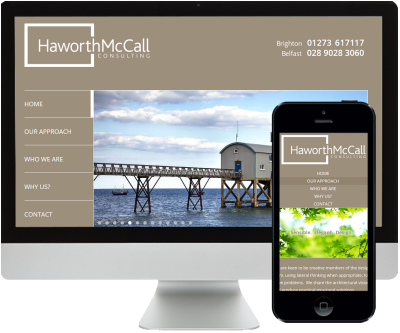 We often work closely with Smith Design Agency to develop websites that integrate seamlessly with the rest of the branding developed for a company. Graphic designers will come up with a concept for a website along with other pieces of branding material including business cards, flyers, billboard and magazine adverts and brochures. We then take the concepts and turn them into fully functional websites that include all the SEO, contact forms and HTML elements crucial to make the site behave properly. This can greatly benefit the client as initial drafts are presented to the graphic designer rather than the client. Fine tuning and tweeks can then be made in consultation with the designer so the client only has minimal contact with us to discuss content, etc. Last week we completed a project for Haworth McCall Consulting, a team of structural engineering consultants based in Brighton and Belfast. Flat draft layouts of the design concept were presented to us and we put everything together including producing a mobile friendly site and adding jQuery slideshows to showcase their projects.